Pokémon GO Plus: The challenge of casual pervasive gaming? Pokémon GO Plus package contents. 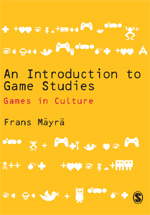 Our research projects have explored the directions of pervasive gaming and more general ludification trends in culture and society. One of the success stories of last year was Pokémon GO, the location-based mobile game by Niantic (a Google spin-off) and Pokémon Company. When winter came, the player numbers dropped: at least in Finnish winter is became practically impossible to play a smartphone outdoors game in below-freezing temperatures. 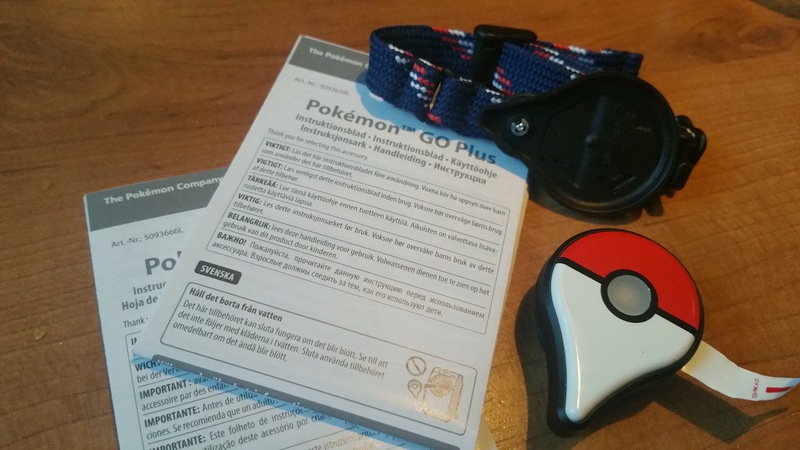 Considering that, I have been interested in trying the Pokémon GO Plus accessory – it is a small bluetooth device with one button that you can wear, so that constant handling of smartphone is no longer needed. 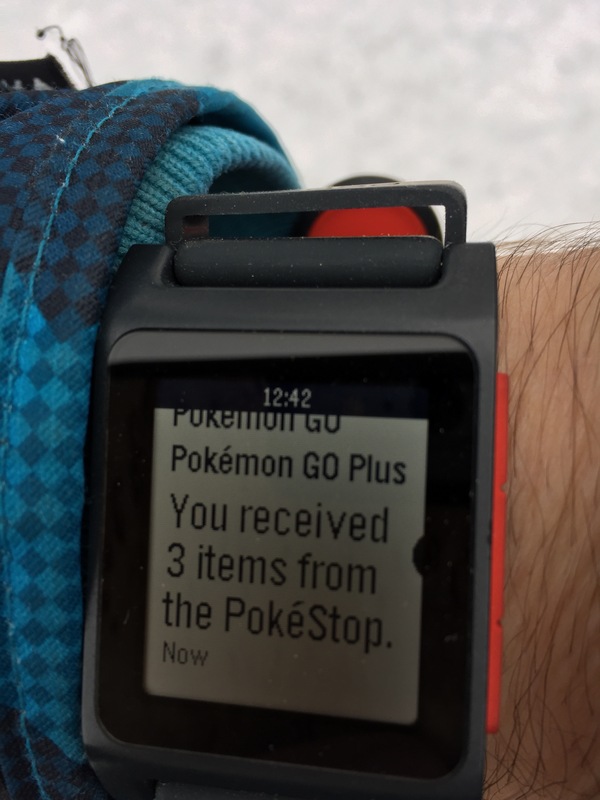 Pokémon GO Plus notifications via iPhone in Pebble Time 2 smartwatch. 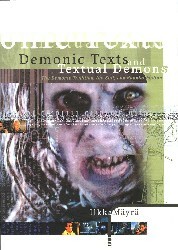 Based on a couple of hours quick testing, this kind of add-on certainly has certain potential. It reduces (an already rather simple) game into its most basic elements: the buzz and colourful led signals when there is a familiar (green) or new (yellow) Pokémon creature nearby, ready for catching. Pressing the button will automatically try to capture the virtual critter: easy ones usually register as “captured” in a few seconds (rainbow-style multi-coloured led signal), more challenging ones might “flee” (red light). When one arrives next to a Pokéstop, there will be a blue light & buzz signal, and with a press of button one can quickly interact with the stop, and get all available items registered into ones inventory. This is actually much more convenient than the usual routine of clicking and swiping at stops, Pokémons and balls. When the “Plus” is active, the game app itself also keeps running in the background, registering walking distances also when the phone is locked. This is how the game should function in the first place, of course. It seems that it is also much easier to capture Pokémons with the “Plus” than without it (how fair this is to other gamers, is a subject of discussion, too). 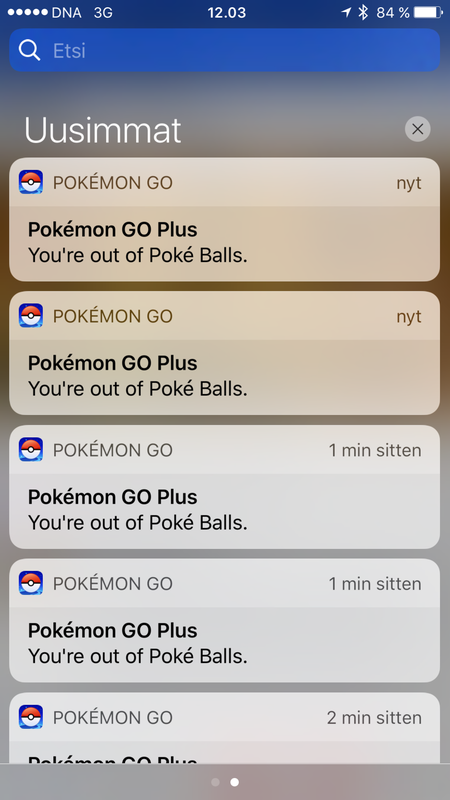 Pokémon GO Plus notifications on iPhone 6 Plus screen. The larger question that remains is, what “casual pervasive gaming” will become, in the long run. If this kind of devices show the direction, it might be that a casual, always-on game will be more like a “zero player game”: an automated simulated of gaming, where game server and game client keep on making steady progress in the game, while the human player is free to concentrate on other things. Maybe it is enough just to check the game progress at the end of the day, getting some kind of summary of what the automated, “surrogate player” had experienced, during the day? Playing Pokémon GO with the “Plus” add-on is not quite there, though. There were moments today when the device was buzzing every few second, asking for its button to be pressed. I quickly collected a nice selection of random, low level Pokémon, but I also ran out of Poke Balls in a minute. Maybe the device is made for “Pokémon GO whales”: those players who use real money to buy an endless suppy of poke-balls, and who are happy to have this semi-automatic collecting practice going on, whole day, in order to grind their way towards higher levels? The strategic element of choice is mostly missing while using the “Plus”. I have no specific knowledge which Pokémon I am trying to capture, and as the game is configured to use only the basic sort of Poke Ball automatically, any “Great”, or “Ultra” balls, for example, are not used, which means that any more challenging, high-level Pokémon will most likely be missed and flee. At the same time, the occasionall buzz of the device taps evokes the “play frame” of Pokémon GO – which relates to the “playful mindset” that we also have been researching – so it is easier to keep on having a contact with a pervasive gaming reality, while mostly concentrating on mundane, everyday things, like doing grocery shopping. Some of us are better at multitasking, but experiments like Pokémon GO Plus provide us with a better understanding on how to scale both the game-related information, as well as the in-game tasks and functionalities, so that they do not seriously interfere with the other daily activities, but rather support them in the manner we see preferable. At least for me, wearing the “Plus” made those winter walking trips a bit more interesting and motivating again today.